Steve Kilby, North Carolina State Champion, Galax champion. Again, I would like to express my appreciation for all of your efforts, courtesies and artistry. “A person who works with his hands is a laborer.” “A person who works with his mind is a craftsmen.” “ A person who works with his heart is an Artist.” You both qualify as the latter without a doubt. Thanks again for a Great guitar and wonderful experience. This is truly my best guitar and one of my best purchases ever. I stayed up till midnight playing it and I still marvel at the tonal quality and voice. 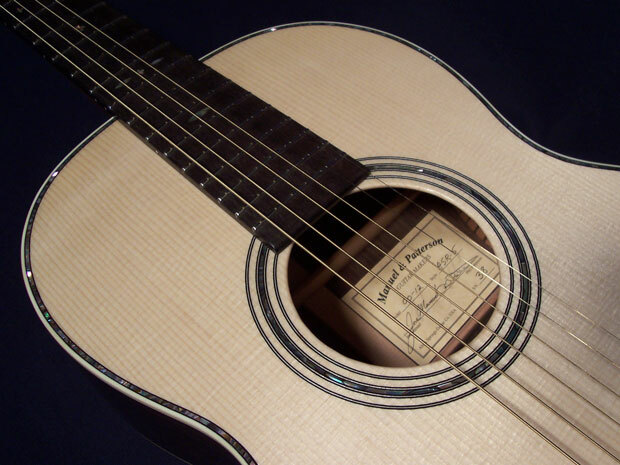 The shorter neck is different and very easy to play. It is truly a fine instrument. I received the guitar today, and already I am amazed. The quality of construction is top notch, and I am comparing your guitar my Webber, Bourgeois, and Langejans. 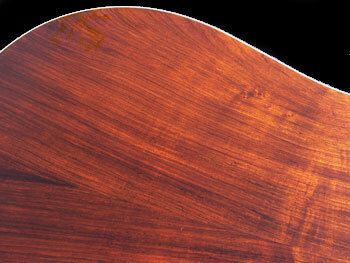 The wood on this guitar is beautiful. It plays like a dream, and my hands are just flying all over the guitar. And how do I do justice to the sound? So full, complex, balanced, and loud. 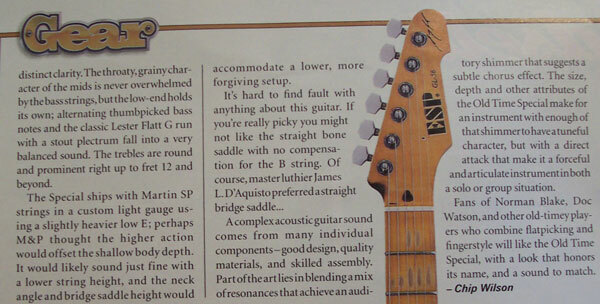 Everything I read about your guitars are true. You guys are artists. I can't thank you enough. I will keep this guitar forever. also think she is the prettiest girl at the dance. 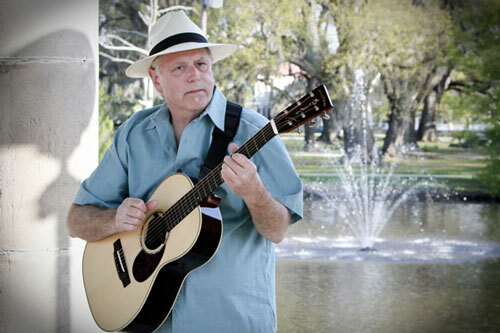 "Joe Manuel is one of the best old-time musicians in Louisiana or anywhere else. He tells the truth when he plays; listen, and you'll know." 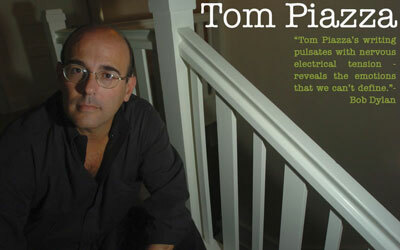 Tom Piazza, Grammy Award-winning Author of True Adventures with The King of Bluegrass & My Cold War. 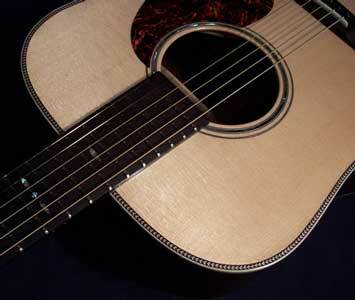 I have always loved the sound of small-bodied, 12 fret neck guitars. Less vibration is lost in the neck due to its shorter length, and the relocation of the bridge, the braces and bridge plate all contribute to enhanced amplitude and tone. 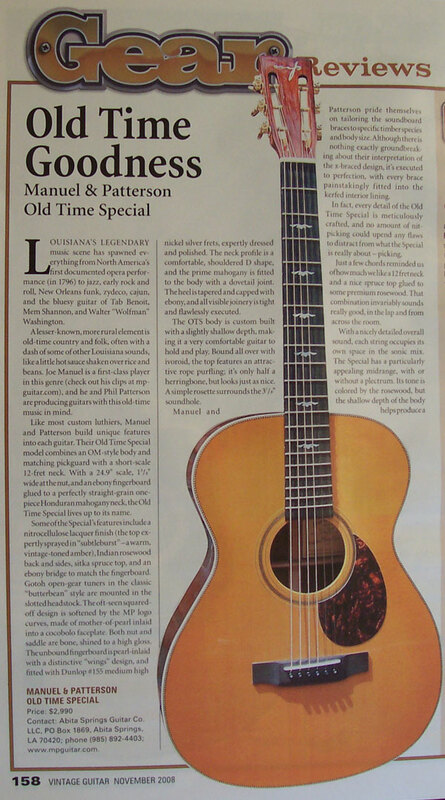 When I saw the Manuel & Patterson 00-12 at a favorable price on their website, I went to check it out. 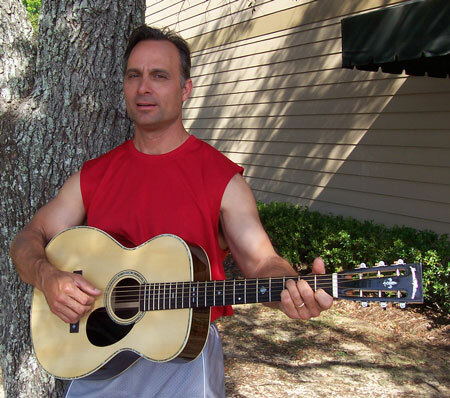 It only took a few minutes before I decided I wanted to own the great-sounding guitar, which was made from premium timbers with high standards of workmanship and playability. 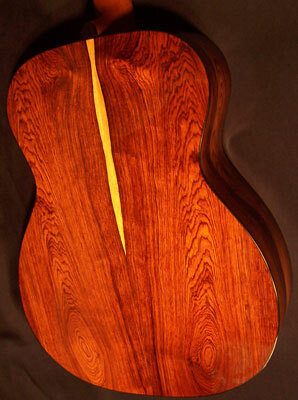 I worked as a guitarmaker for over 20 years, making archtops, so I have a good idea of the effort it took to produce this instrument. SEE CHIP & HIS 00-12 IN HIS NEWEST MUSIC VIDEO AT THIS LINK! 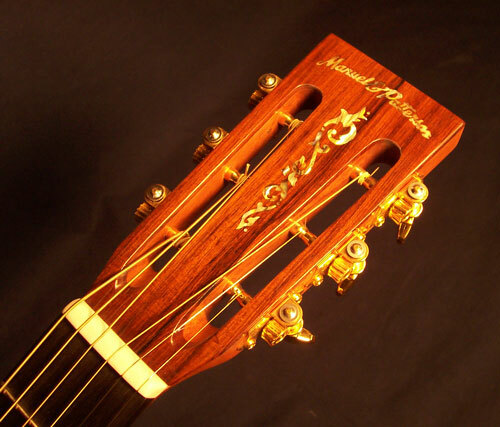 My Manuel & Patterson guitar is awesome! 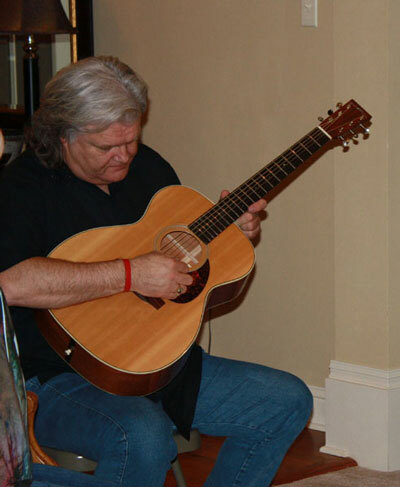 "The guitar y'all made for me, 'Michelle', is, hands down, the most amazing acoustic guitar I've ever played. Whenever I break this thing out for a gig or a session or a nice day of busking in Boston Commons, I get the same mix of confused double takes, sweet smiles, and jealous looks. She's a bit of a strange bird. 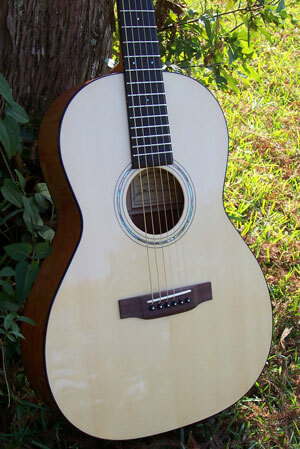 Not only y'alls first 7 string, but the first guitar y'all built with a cutaway. I'll tell you something, though: Y'all got it perfect in every detail. Everyone who's played this guitar remarks on how she sounds, how she feels, and how she looks. It's always positive. I get offers for this guitar almost every time I play her in front of people. But I'll assure you of this: They can get this guitar from me when they pry it from my dead hand, because I'm not giving this one up!" The guitar got here yesterday in great shape. The construction and detail are perfect.The action and playability are perfect as well. 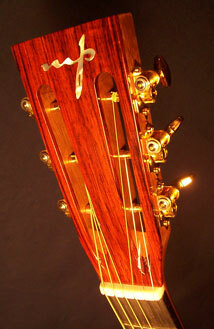 I have 2 other all Mahogany guitars (Martin& Collings) and this one blows them away. I would highly recommend the whole experience especially the end product. you....based on the comments I've received so far. for building such a great instrument. I purchased your ASM-2 Old Time Special Demo a short time ago and have not taken the time to let you know how it works for me yet. I am very simply blown away. 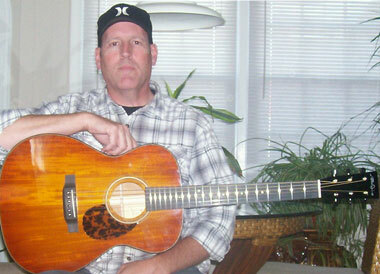 I own and play several Martin & Gibson dreds, as well as a beautiful old Guild F50. 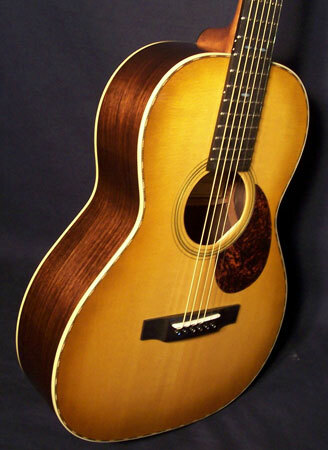 I have been looking for a short scale 000 with an Adirondack top. Obviously the ASM-2 was what I was looking for and more. 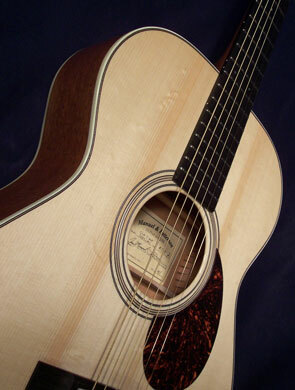 I was so impressed with the quality and sound of this guitar that I lent it to the Luthier that is doing a neck reset on my 0017 Martin. ( He is ) an independant and is also the in house Luthier for a large chain here in the Northeast, I'm not sure if they make it down your way or not. At any rate he also was impressed as well as the manager of the guitar shop. 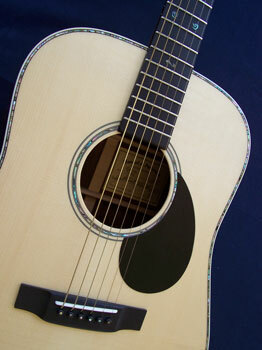 Everyone loves playing it and there are probably 50 to 100 Martin,Gibson and Taylors in the store. I gave (him) one of your cards and told the guys to keep ( the Old Time Special ASM-2 )for a couple of weeks. I hope some good things happen for you. Right now, a bunch of good people are playing your guitar and I want it back!! 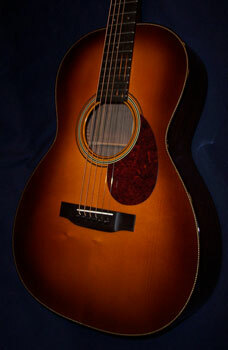 Quality instrument; sound, craftsmanship, finish, playability all 10's..get one! 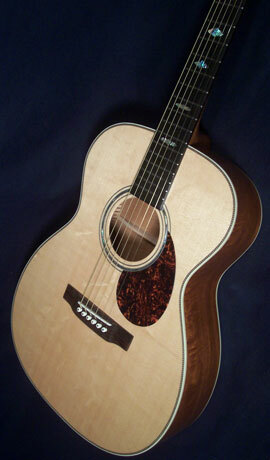 I want to let you know how much I've enjoyed my Figured Mahogany 000-14 with Bearclaw Sitka top. It sounds, looks and plays great! The quality of construction, craftsmanship and tone are second to none. 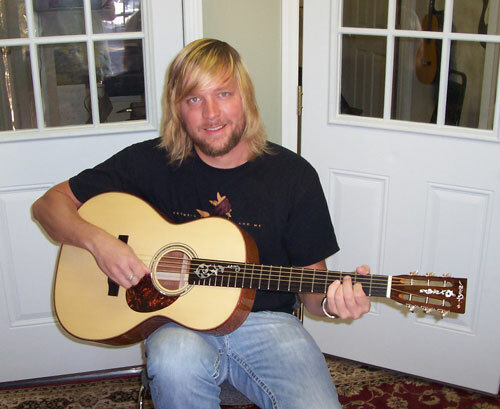 I have several other nice guitars including a ( Martin Custom Shop D-42, Martin HD-28 and a Brazilian rosewood Bourgeois D-150 ) and the guitars you build are in every way on par with them. They sound amazing and they play with incredible ease. I have to thank you for the countless hours you spent going over every detail with me. No matter how small or insignificant it may seem to you, it's pretty exciting to be able to watch and photograph practically every step in the process. 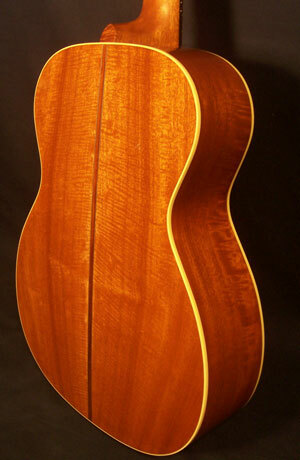 I suspect there are very few, if any, luthier's who make it possible for the purchaser to be as involved in the construction process as I was. amount of money.I know!! You out did yourselves again. I purchased a Gibson Les Paul electric, two Taylor and one Martin acoustic guitars from you guys through the years and the reason I purchased from you guys is you can truly trust your honesty, knowledge and craftsmanship. After having said that I sold them all and had you make me one which we designed together. Not only was it invigorating and exciting to do this together, it is also the best sounding guitar I have ever owned. Thanks, and I would do it all over again. You guys are “ The Guitar Masters”. 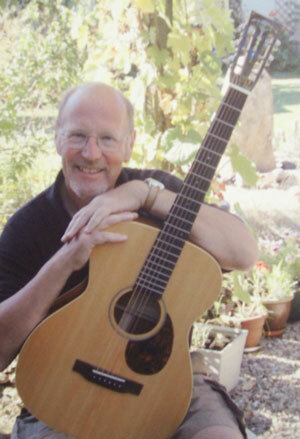 Just to let you know that I am delighted with the guitar. It really is very pretty and has a wonderful tone.Thanks again and good luck. 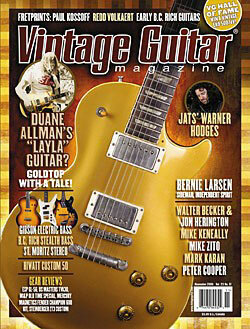 Buy one of these guitars, you will be amazed at the quality & perfect tone. I love this guitar! It's as simple as that. I knew that before I even got to see one, that these instruments would be something to marvel at. I found my anticipation and expectations were not even close to the reality. 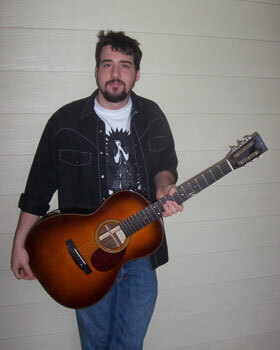 I have owned many acoustic guitars but this is the one that gets the ring and gets buried with me. 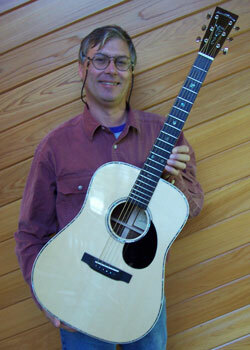 Joe and Phil are amazing players and craftsmen who build guitars to be played and admired. 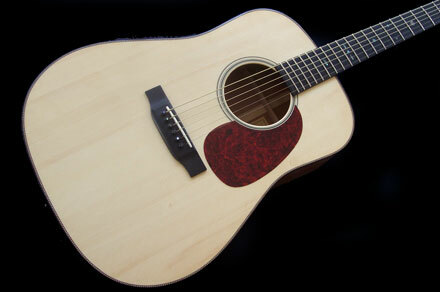 My new, custom Manuel and Patterson Indian Trail Dreadnought is fantastic. 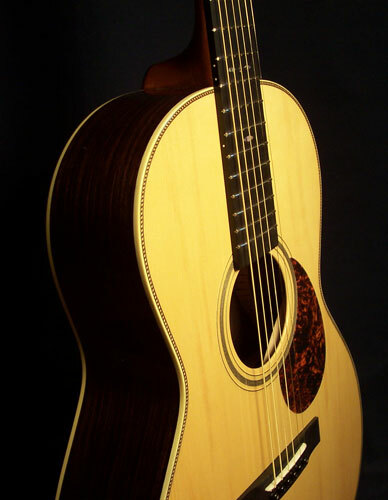 Thank you for spending all of those hours with me going over each detail, from selecting the Brazilian Rosewood and Adirondack Spruce, through designing the purfling and decorative motifs, to selecting the tuners and pickguard. It was great to be a part of the process. 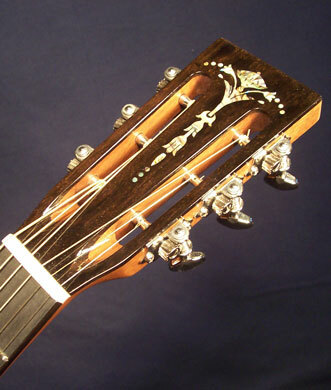 The back, sides, and top are flawless; the neck is perfect; the pearl rosette and purfling are stunning; and the Marksville Period ceramic motifs on the headstock and fretboard are exactly what I had envisioned. I've only been able to play it for a couple of weeks and it is a "killer". It plays well all over the fretboard, has a beautiful tone, and the best part is that its only going to get better with time.It really is a high-caliber instrument that I'm proud to own. 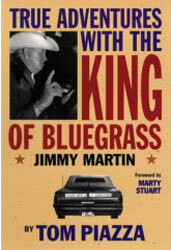 I can't thank you enough for my Opry Special. I am in love with this guitar. Everyone who has heard it has used the same word to describe it: Balanced. "These guys know what they're doing." I agree. The guitar arrived safe and sound. 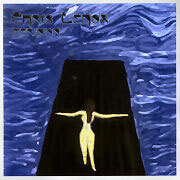 I played it last night and it sounds great and feels very comfortable to play. It looks very good also. I can't wait to take it to a jam. Thanks a lot. 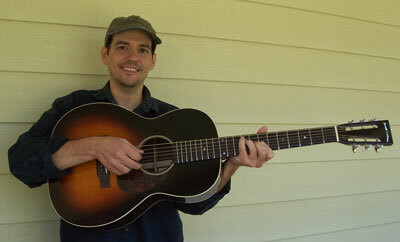 I can't say how pleased I am about my new "Opry Special" Abita Springs guitar. The workmenship and attention to detail is amazing. From the headstock to the strap button, and all places in between, it is truly a work of art. Even better is the easy and comfortable way it plays. Every time I get an opportunity to pick with a new group of folks, people will comment on the guitar's looks. Then, when they hear how it sounds they'll usually ask if they can play it. I've had a chance to play it in different settings with various vintage and new instruments (including Martins, Gibsons, Collings, etc.) and it never takes a back seat in either tone or volume. Y'all have crafted a truly great guitar and I'm proud as punch to own it.